Roll-on/roll-off (RORO or ro-ro) ships are vessels designed to carry wheeled cargo, such as automobiles, trucks, semi-trailer trucks, trailers, and railroad cars, that are driven on and off the ship on their own wheels or using a platform vehicle, such as a self-propelled modular transporter. This is in contrast to Lift-on/Lift-off (LoLo) vessels, which use a crane to load and unload cargo. As you would know, from automobile towns, vehicles get exported – from Chennai thousands of Hyundai cars get exported – these are transported by special Car Carriers which are RO-RO vessels. Going by some informed sources that the first modern train ferry, was the Leviathan, built in 1849. Its birth was necessitated by the non-availability of a bridge and the Company - Edinburgh, Leith and Newhaven Railway hit upon a novel idea of transporting goods by a train ferry. During World War II, landing ships were the first purpose-built seagoing ships enabling road vehicles to roll directly on and off ~ and can well be pre-cursors of modern RORO. The British evacuation from Dunkirk in 1940 demonstrated to the Admiralty that the Allies needed relatively large, ocean-going ships capable of shore-to-shore delivery of tanks and other vehicles in amphibious assaults upon the continent of Europe. 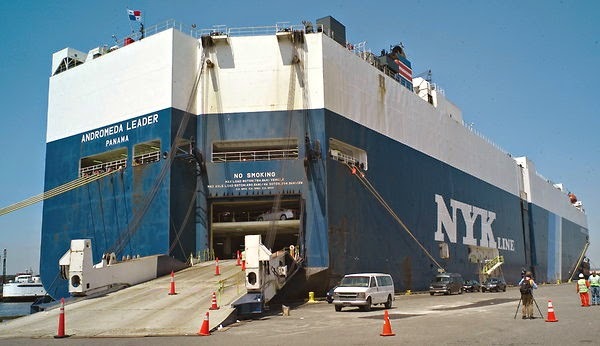 The present day car carrier ships are nautical workhorses of the industrialized world. 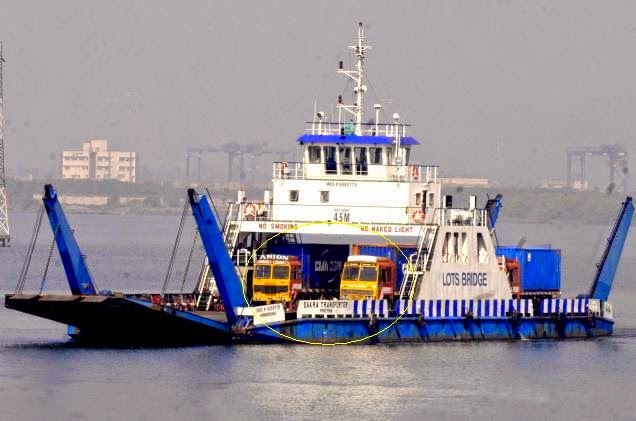 Hauling up thousands of vehicles in various decks packed tight, these ships deliver vehicles carrying them in compartments and taking them unscathed to various destinations….. now this post is something on a different RO-RO – on waters – not on sea waters though !,.. here is something reproduced from The Hindu. Re-routing of container-laden lorries through Kundanoor-Edappally NH Bypass and the resultant increase in traffic congestion on the bypass has led to an all-round demand for introducing more RoRo (Roll-on Roll-off) vessels between Willingdon Island and Vallarpadam. Because of the massive traffic snarls at four major junctions on NH Bypass, container lorries had been diverted through Seaport-Airport Road. But their journey through the Bypass was restored in June, after trailer operators and drivers cited difficulties in commuting through the narrow Kundanoor-Pettah-Irumpanam stretch to reach Seaport-Airport Road. Edappally Traffic Police, stated that trailers were banned through the Bypass from 8 a.m. to 11 a.m. and from 4 p.m. to 7.30 p.m ~ and that further regulations might be necessary when work on four flyovers gain pace. Trailer operators and other stakeholders have demanded introduction of at least one more RoRo vessel through the backwaters, to lessen congestion caused by such lorries in the busy road. But sources associated with container transport said even the existing RoRo vessel was under-utilised. “The vessel has a capacity to hold 20 container lorries and can ply up to 24 trips each day. Not even 50 per cent of its capacity is being utilised, because trailer operators and drivers prefer to commute through the bypass though they incur double the operational expenses as compared to Rs. 600 (for 20-feet container) for a one-way RoRo trip. This is apart from congestion, pollution, accidents and road rage caused by trailers,” they said. The RoRo currently ferries less than 100 trailers, which is around one-fifth of its capacity. The President of Cochin Container Carrier Owners’ Welfare Association, spoke of how trailers sometimes had to wait for around three hours for the RoRo. “Trailer drivers get disillusioned since they are unable to operate optimal number of trips daily, which affects their trip-based wages. RoRo will get more patronage if more such vessels are put into service, so that trailers need not wait for so long. Cochin Port Trust must take the initiative in this regard,” he said. Rebutting the claim of three-hour wait for RoRo, sources said it generally took an hour for a return trip. “The commuting time between the two points is just 22 minutes, while driving trailers in and out of RORO takes seven minutes at each point,” they said. Ninaithale Inikkum was a grand musical hit – score by MS Viswanathan. Of the many, there was one sung by SPB & P Susheela – ‘Yaathum Oore Yaavarum Kelir’ …. in that hundreds of motorcycles (Hondas !) would be driven through the open platform of the ship to Singapore (or was that Malaysia) – a rage for people of our age to see nice vehicles – being carried in a ship – perhaps that was the first occasion, I saw a Ro-Ro vessel. Rajnikant’s mannerisms were quite a hit and there were one too many in the initial days … his flipping the cigarette was touted as a great style. In the film, there will be a challenge for flipping 10 cigarettes without even one falling – bet was a ‘Toyota car’ – as he would do the initial ones successfully, the other person would slowly keep items like a sharp knife, solution – all indicating cutting of finger………. Much close to winning, Rajni would give up with mortal fear. Read that this is a scene based on Roald Dahl's Man from the South. "Man from the South" is a short story by Roald Dahl originally published in Collier's Magazine in 1948. It has been adapted several times for television and film, including a 1960 version starring Steve McQueen and Peter Lorre. In this story, an elderly man named Carlos offers a boastful American young man his green Cadillac, if the boy can strike his lighter ten times in a row. The catch is that if the lighter does not light ten times in a row, Carlos will cut off the American's left little finger.